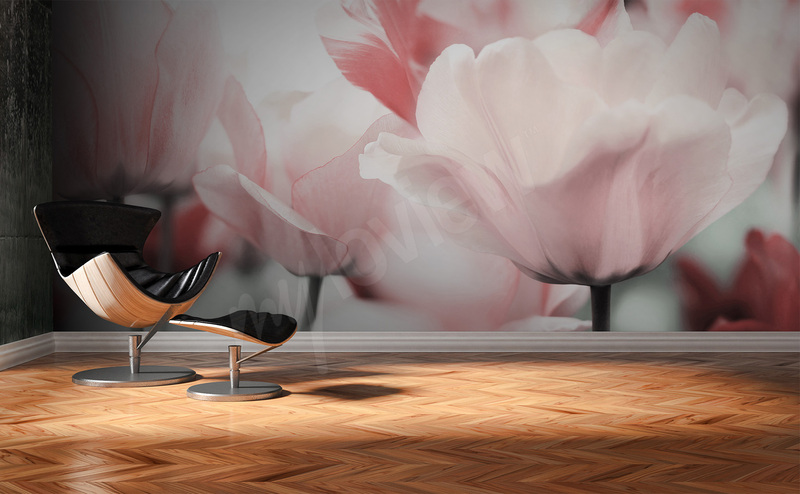 Tulip wall mural can be an incredibly graceful decoration of a living room. Colorful flowers on long, slim stems will add lightness and freshness to every interior, no matter what stile it’s decorated in. Depending on our preferences, we may choose a tulip wall mural with a single flower, complex compositions depicting entire handfuls of those plants, or a simple depiction of Dutch tulip fields with windmills in the background. 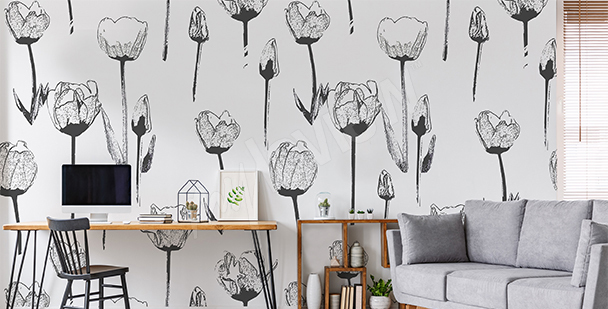 One thing is clear – a tulip mural will look great in every type of interior. White tulips on a black background are an elegant addition to any modern, spacious living room. 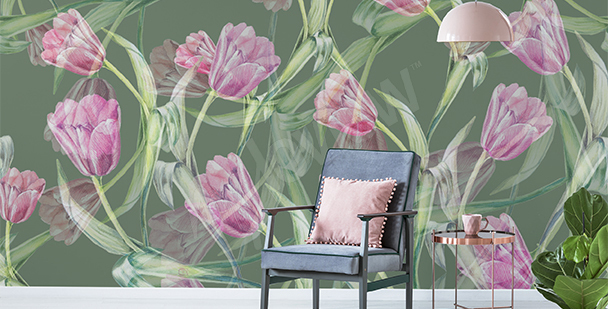 A wall mural with a field of pink tulips will add dynamism to an eclectic decor and will give it a bit of color. White tulips on a wall mural will complement every space that lacks an intriguing, but delicate decorative element. 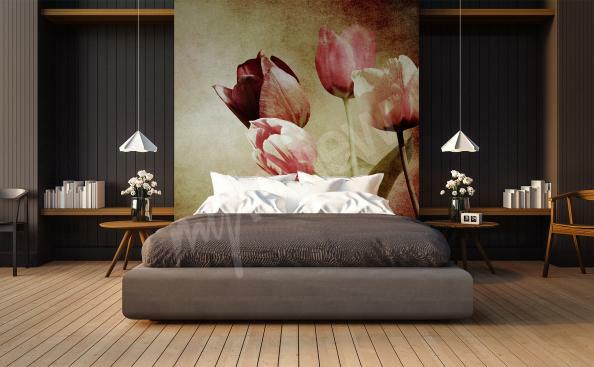 Pink tulip petals on a wall mural are a great solution for a feminine bedroom decor. A minimalist tulip? 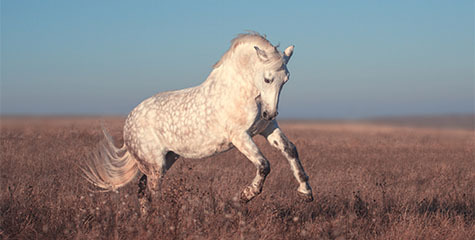 A black and white print will fit nicely into an ascetic composition, for example in a bedroom. Macro photography of tulips will be an important decorative element in a classic living room space. 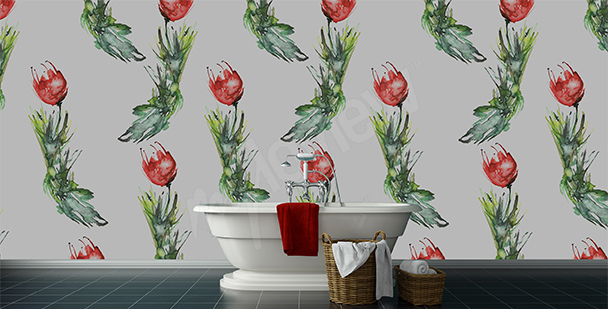 A flowery wall motif in form of a wall mural can be placed not only in a living room, but also in a bathroom. A spacious loft will gain a unique character when decorated with an expressive wall mural with white tulips against a black background. White tulip petals on a wall mural will soften a modern interior arrangement. 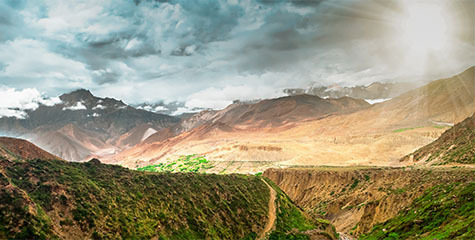 Such wallpaper should be placed on just one of the walls. 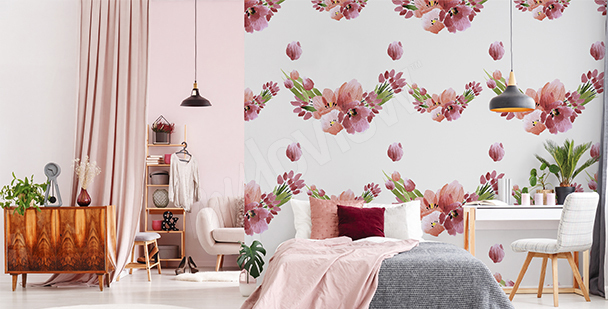 Spring tulips on a 3D wall mural are very eye-catching, that’s why it’s best to use this type of wall print in a living room. 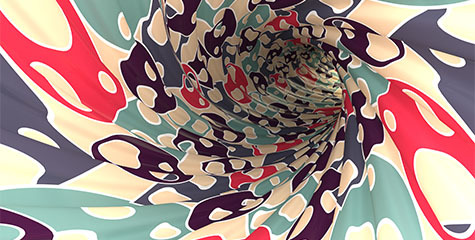 Tulip wallpaper is an offer for all lovers of elegant and flowery motifs in living spaces. 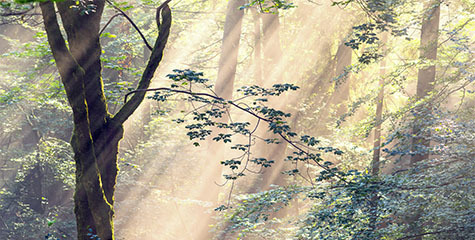 With use of a charming motif, you will make your interiors look more attractive and more fairytale-like. 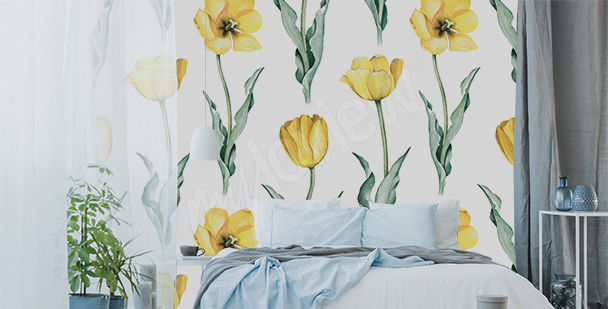 Tulip mural can be used as a part of decor of both classic and modern interiors. The design is available in so many different variations, that you will easily select a fitting decoration to the style of your interior. 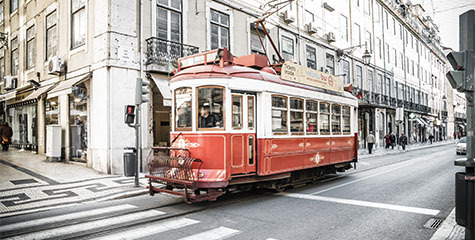 Tulips will be a beautiful complement of eclectic interiors, as well as public spaces and fashion boutiques. 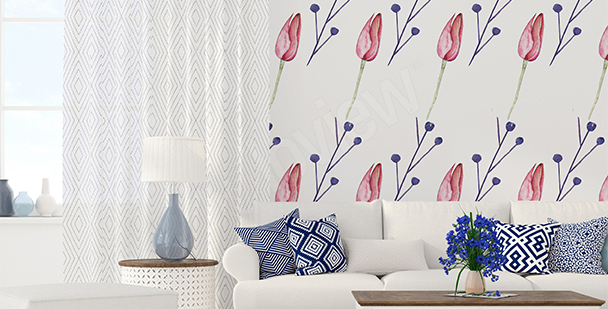 This graceful flower will improve every type of space – a tulip wallpaper is a noncommittal and subtle decoration that will create a harmonious whole with bright and pastel colors. Tulips are graceful flowers with slim, delicate stems and a subtle, colorful calyces. No wonder that this flower motif is so gladly used as interior decoration – and not just on tables, sideboards and curtains, but also on walls. 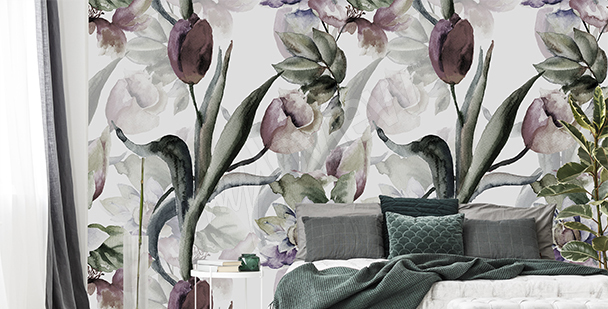 Tulip wall mural will be a great complement for classic upholstered furniture – multicolor flowers will look great together with a plain sofa in beige or gray. 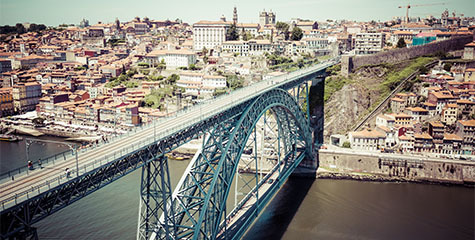 Green accents will energize a modern interior dominated by dimmed colors – white, ashy gray and steel. Pink tulips in form of an effective photograph against a bright background will emphasize the beauty of accessories and decorative details in this sweet feminine color. Red flowers can be used in a living room dominated by elegant details and contrasting arrangement solutions. Tulip wallpaper will be an expressive accent in an interior dominated by white walls and decoration in white color scheme. 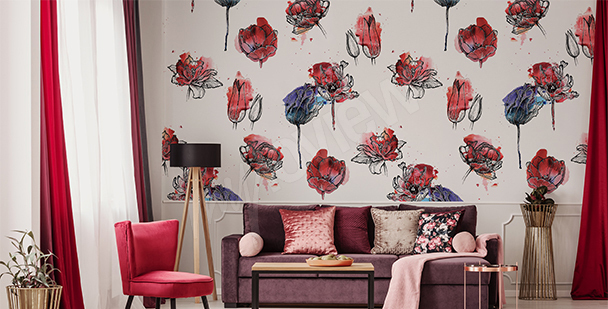 Red flowers against a blue background will look great in a modern space, dominated by ruby and white elements – tulip wall mural will give the interior a distinct character. If you want to create a unique atmosphere within your interior, and you want to give it a very sophisticated look, choose a colorful composition with flowers in shades of pink, purple and fuchsia. 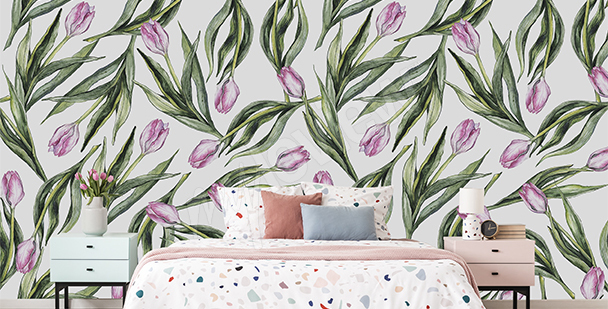 A spring motif has a universal use – tulips can be successfully applied into various stylizations – from a glamour living room to a rustic bedroom. 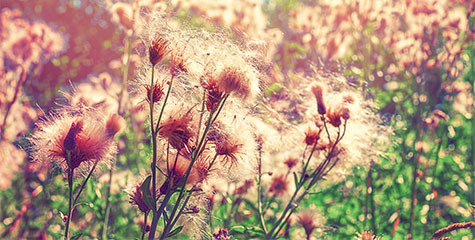 This encourages decorating walls with a flowery design and tulip wall murals. White tulips can be successfully used in elegant, classic and modern interiors. Such decoration will make the space look subtle and thanks to the green leaves you will easily energize and refresh your space. 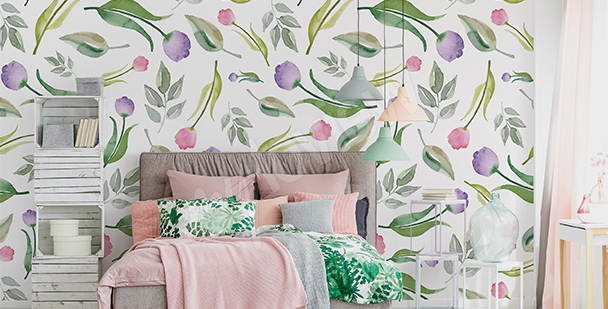 This design can be used in a romantic bedroom dominated by flowery motifs, bright decor accessories and bright, delicate textiles. Such mural can also be fitted into a tasteful kitchen – a decoration will give it a sophisticated look and will emphasize the beauty of white details, elegant accessories and glass accents. 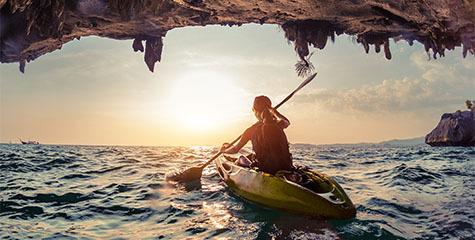 This way, your interior will gain an effective decoration and will look absolutely beautiful. It’s worth to remember that flowers will make a toned-down, classic decor look more attractive by harmonizing with a bright color scheme of the walls, furniture and decoration details. If you’re a fan of sophisticated decoration, then you can choose a green tulip wallpaper to decorate your dining room’s walls.